Work in this area is mainly directed through our Business School, which was recognised by REF 2014 as having significant impact. 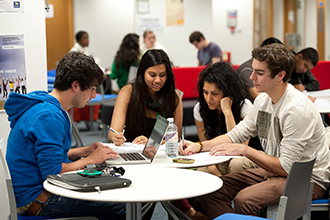 The Business School is engaged nationally and internationally through research to promote entrepreneurialism and social enterprise for the betterment of society. Our long tradition of research in small business and enterprise has had considerable impact on aspects of entrepreneurship education, finance and marketing contributing significantly to the development of enterprising individuals across the world. Our Business School has carried out focused research on entrepreneurship education and graduate entrepreneurship since 2004. Specifically, much of the research has sought to track the impact of entrepreneurship education on graduates over time. We're dedicated to developing a stronger understanding of the foundations and process of growth and development. CREDIT seeks to place the regional economy in a global context, aiding policy makers and local business stakeholders alike.